Hand-drawn batik on cotton damask fabric with Indigo dye (174" x 48"). Partial view shown. Design of pieces may vary. Cotton fabric machine-stitched tie-dyed with natural indigo dye. Double-length ( 164" x 47"). Partial view shown. Cotton damask fabric cassava resist-dyed with natural indigo (86" x 48"). Dyed in the traditional Yoruba "OK & Matches" or "Cube" pattern. Partial view shown. Cotton damask fabric cassava resist-dyed with natural indigo (88" x 49"). Dyed in the traditional Yoruba "Lizards" pattern. Partial views shown. Cotton damask fabric cassava resist-dyed with natural indigo (103" x 50"). (76" x 44") partial view shown. Strip-weave cotton fabric with fringe, dyed with natural indigo dye (86" x 45"). Strip-weave cotton fabric batik-dyed with natural indigo dye, using stencil for resist (67" x 41"). Commemorates Journee Ingternationale de la Femme (International Day of Women). Strip-weave cotton fabric stitch-resist dyed with natural indigo dye (60" x 44"). Strip-weave cotton fabric stitch-resist dyed with natural indigo dye (61" x 42"). Hand-drawn batik on cotton damask fabric with Indigo dye (172" x 48"). Partial view shown. Cotton damask fabric tie-dyed with natural indigo (172" x 48"). Partial view shown. Cotton fabric tie-dyed with natural indigo (176" x 49"). Partial view shown. Vintage "Ndop" cloth cotton fabric stitch-resist dyed with natural indigo dye. One of a kind pillow designed and constructed in United States with antique fabric from the Cameroon. 12" x 20" pillow with linen backing. Individual fabric designs will vary. 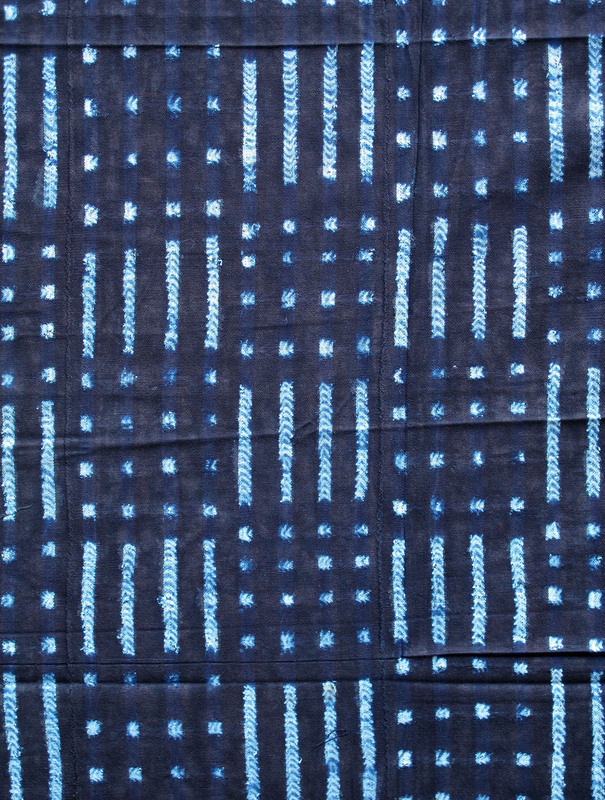 Cotton damask fabric cassava resist-dyed with natural indigo on turquoise-dyed fabric (88" x 50"). Partial view shown. Indigo and white ikat strip-weave (10-strip) cotton fabric, with cotton thread dyed with other colors. (54" x 41"). Vintage fabric, as shown. (56" x 44"). Vintage fabric, as shown. Indigo and white ikat strip-weave (10-strip) cotton fabric, with overstitching of cotton thread dyed with other colors. (60" x 42"). Vintage fabric with some minor staining and tears, as shown. Cotton damask fabric tie-dyed with natural indigo ( 78" x 50"). Partial view shown. Cotton damask fabric tie-dyed with natural indigo (90" x 48"). Partial view shown. Traditionally worn in Mali as a head-scarf, these scarves can be used for any scarf need.